SOMETHING has been niggling me ever since I took delivery of my R1150R back in April. It’s the small matter of getting a slick, judder-free gearchange – the kind of clean shift that sends barely a ripple through the bike. Once or twice I’ve got lucky and managed something approaching the perfect change. But the hit rate has been too low and inconsistent. At times I’ve been left cursing my cack-handed attempts at slick shifts which have sent some seismic wobbles through the frame. I don’t blame the bike, but for some reason I just couldn’t adapt my riding style to the BMW. It’s the first bike I’ve owned with shaft-drive. I suspect that, combined with my less-than-brilliant attempts at getting on and off the throttle during gearchanges, has conspired to cause the problem. Anyway, as I said, it was niggling me big-time until I got the chance to ride pillion on my own bike, courtesy of MCN features editor Marc Potter, who was after a lift to work. And no, he isn’t too keen on riding pillion. After getting over my initial nerves – I hate going on the back, too – one thing struck me. It was the super-smooth gearchanges Potter was achieving. In the office car park, he revealed the secret. Rather than completely shutting off the throttle, Potter was knocking it off a quarter. I grabbed my lid and headed straight out on to the road. After a few attempts, my shifts became seamless. No more wiggling or wobbling, just smooth swopping from cog to cog. For the record, I tend to find myself shifting at around 5000rpm, which is also when the engine is producing max torque. There’s something really satisfying about getting it right on a bike and this little improvement to my riding technique has paid major dividends. Even a Sunday afternoon blast has taken on a new dimension as I make smooth progress through the Northants countryside. I’ve also discovered the pillion perch is pretty comfortable. The seat is wide enough to avoid the early onset of numb bum and the pegs are at a nice height. With the rider sitting in an upright position you’re pretty well protected from any wind blast. There is a grab strap, but I think I would prefer a pukka rail. My wife found it pretty comfortable when I took her out for a spin as well – certainly better than the sports bikes I’ve tended to own in the past. (0870-240-2118). A tasty carbon oval end can replaces the standard steel silencer. The collector box and catalytic converter have also been removed and replaced by a simple stainless steel Y-piece which connects the can to the original downpipes. 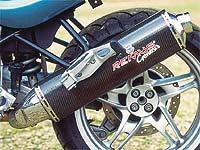 The result is a useful few kilos shaved off the weight and a very cute-looking exhaust. The package costs £515. If you don’t fancy the carbon can, there’s a choice of either titanium or alloy versions, both in the same oval shape. Either option will save you £60. The Remus kit is completely interchangeable with the original BMW parts. So you could keep the standard end can and replace the collector box with the Y-piece, or keep the collector box and swop the BMW silencer for the Remus can. The good news is the system bolts on and runs – though in some cases it can send the idle speed up from the usual 1150rpm to around 1500rpm when the engine is hot. I went the whole hog and it’s made a real difference to the performance. Independent dyno tests by MCN’s sister magazine RiDE indicate the Remus system provides a power gain of about 5bhp across the rev range, taking peak power up to around 90bhp. Torque is also improved. You can really feel it on the road. The throttle response is much stronger and much crisper. Twist the grip and the bike comes alive with a real snap. The mid-range also has more punch and the engine revs more cleanly. The bike also sounds a lot better, too. OK, I have to hold my hands up here and admit the can is not exactly road-legal and bears a legend to that effect. But it now sounds like it looks – purposeful and aggressive. The exhaust note has taken on a deep growl which becomes a full-blooded howl when you’re on it. Roll off and there’s the odd pop and bang on the overrun. Riding a gear higher than normal around town keeps the noise down to respectable levels and the huge amounts of torque available from the motor means trickling around is not a problem. You can hear what the new pipe sounds like by clicking the related link to the right of this page. One of my first trips with the new pipe fitted was down to the Goodwood Festival of Speed – a cracking event featuring everything from vintage race cars to 500 GP bikes and Formula One cars blasting up a tight track in front of the historic house. Most of the 300-mile round trip was on motorways and the BMW kept up a steady 80mph with no problems. The bike felt rock-solid, with no hint of vibration, and the tiny winglets either side of the headlight did a decent job of deflecting wind blast. After brimming the tank I managed more than 140 miles before the yellow fuel light came on. The mpg improved from its usual low-40s to approaching 50. The final stretch down to Goodwood was mainly tight B-roads and the bike lapped it up. You really feel you can sling it into turns and can be confident it will stay planted right on line, with plenty of reassuring feedback from the front. On the way back, the weather turned seriously nasty. We are talking about the kind of thunderstorms that would have earned a mention in the Bible. The roads out of Goodwood resembled rivers. I mean, when was the last time you had to steer your way around discarded Coke cans and driftwood floating down the road? But the Beemer hung in there without complaint. There was plenty of grip from the tyres and enough feel from the brakes to tackle the hazards without much drama and the heated grips did a valiant job of trying to keep my gloves dry – though I never expected to have to use them in the middle of July. That was my longest single trip on the bike so far, but I’ve bigger and better ones planned. Some luggage-carrying capacity will be needed, though, so I may splash out on panniers and a rack. Then we’ll be off on some touring trips, which I reckon the R1150R is more than capable of. Supersport CBR takes on both road going versions.